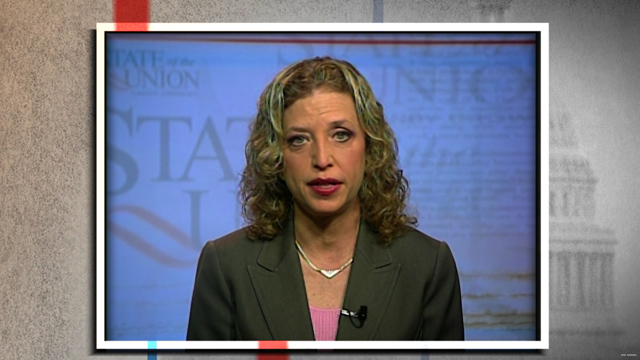 Washington (CNN) – Democratic National Committee Chairwoman Debbie Wasserman Schultz on Sunday classified Democratic efforts in the Wisconsin recall election as a “test run” for the presidential race. Wasserman Schultz, who is scheduled to campaign with Milwaukee Mayor Tom Barrett on Tuesday, said he has a “real opportunity” to oust incumbent Republican Gov. Scott Walker in the June 5 election. But she was quick to add it will also test the Obama re-election campaign and the grassroots operation in the state. Recent polling shows Walker with an edge over his Democratic rival heading into the recall election, the culmination of a two-year fight following the passage of a law that moved to curtail the collective bargaining rights of most Wisconsin state employees. Republicans insisted the bill was necessary to close the budget shortfall and control the skyrocketing costs of public employee benefits, while Democrats argued it was an attempt to gut public-sector labor unions, one of their core constituencies. National groups have spent significant dollars on ads in the Badger State, which has hosted high profile state visits, particularly in support of Walker. Recent polls show President Barack Obama holding a steady advantage over Mitt Romney in hypothetical general election match-ups in the swing state. Obama carried Wisconsin by almost 15 percentage points in 2008 over GOP candidate Sen. John McCain. But the president may face a tough fight in November following Republican wins in the 2010 elections that included the governor’s mansion and two House seats. Scott Walker made it very clear that he works under the thumbs of billionaires and he has no intention of working for the taxpayer. That alone makes him a corrupt official. This guy is a lying weasel and needs to go. A typical TPer, bait and switch, divide and conquer clown. People deserve better! Obama claim that under his watch USA debt very small in 60 years. He got very low opinion of American people. He is something else. She is definitely right in stating that this is a window to the election in November. Based on the fact that Walker is leading, and is probably going to win......means that Romney will definitely win Wisconsin. Voters want jobs, not welfare and foodstamps. Obama claim that under his watch USA debt very small in 60 years. He got very low opinion of American people. He is something else. I also like when he talk about Romney don't have experience to be president. What about community bla-bla-bla. Now people knows how powerful rich folks is when they've got surrigate like walker. They have used money gullibilize the already gullible people. Labor for years is what kept the middle class afloat, now that the last safety rope is removed for the middle class, America middle class can compete with Chinas slave wage middle class. The only problem China middle-class out number us 6 to 1. I wonder where America companies will be rushing to when mitten takes over. Rather than Debbie, if the DNC wanted to send any MONEY to help Barrett's campaign, I might believe they cared about workers. Even Barrett is Weasel McMilquetoast in my book, (proudly campaigned for Doug La Follette in the primary) but we have to get rid of Walker, and the DNC is only now sending one unpopular party leader instead of giving us any financial support, while the RNC has poured nearly 40 million into Walker's already-brobdingnagian coffers? All the DNC cares about is leaving Walker intact as a boogeyman, rather than actually helping Wisconsin rid itself of him and his menace. It funny reading peoples comments on this story. "GOP idiots" "Walker under the thumbs of billionaires" "USA debt very small in 60 years"
Although i vote republican, both sides have done things to harm this country. It meaningless to say that one party is destroying America. For example Obama healthcare is really hurting the creation of jobs. Nixon EPA is hurting the oal industry, which my company relies heavily on. But it doesn't matter what I think I am sure people will read this and think i'm full of it. Voters do not want IRAn WAR either, not shipping jobs to china, India nor bunch of illegals for cheap labor like Myth Robme!! !idiots need to learn. There is an issue that may be nothing, but are there any other "snail-mail" contributors to "Friends of Scott Walker" where their checks haven't been processed or cashed? I certainly hope no postal union workers are involved in diverting or destroying these easily identifiable mail envelopes going to that organization. Excessive union pensions and disproportionate benefits that are bankrupting states and towns are already a crime against taxpayers and society! This woman needs to be thrown out of office herself ! Never have I seen so many blatant lies come from one mouth. She is a prime example of what is wrong with politics. Unions built the middle class. Destroy the unions destroy the middle class. Destroy middle class destroy america. Mikle go back under rock were you were hiding. Gurgyl you definitely should do some research, and maybe read articles/information from other sites, instead of just reading info from pro-Obama media sources. It is Romney that wants to prevent illegals from getting jobs that should be going to US citizens. It is Obama and the liberal Democrats who are pushing for amnesty/rewards for millions of illegals, including giving them US jobs that should be going to US citizens!! Let's hope the people in Wisconsin have more brains then some of the bloggers on here. The SEIU sure would like to put more people into the statehouse that will vote for more money for STATE employees, who cares if those in the private sector have to pay for it. It's like they tell everyone their your neighbors now pay for their benefits you could only dream of. The SEIU also pays for the OWS to disrupt and destroy, did you agree that this should be funded with YOUR UNION DUES. If W-Schulz is the best the DNC can do, I pity the Dems running under her "leadership." What a nasty-looking and nasty-sounding person! Can't help thinking of her as Anthony Wiener's twin! Yeah and the DNC is failing miserably. I have gotten letters from the RNC asking for money to fight the recall, but none from the DNC. these superpacs with all their money, pouring into scott walker's campaign, make me kinda wonder, they so in tune in helping walker win, that they can get their money and wipe out the deficit in that state...but with all their negative ads, they can't buy the people's vote..Barret will come out on top, because the truth will come out...The republicans is the party of lies and deceit, even when the facts is in front of their face... same goes true with the presidential race, the republican superpacs have spent millions and millions of dollars in negative ads, they can get this country out of debt... maybe that's when we should tax the 1% and get their money to help out with the economy instead of wasting it on negativity...GO BARRET, YOU'LL WIN BY A LANDSLIDE!!! !